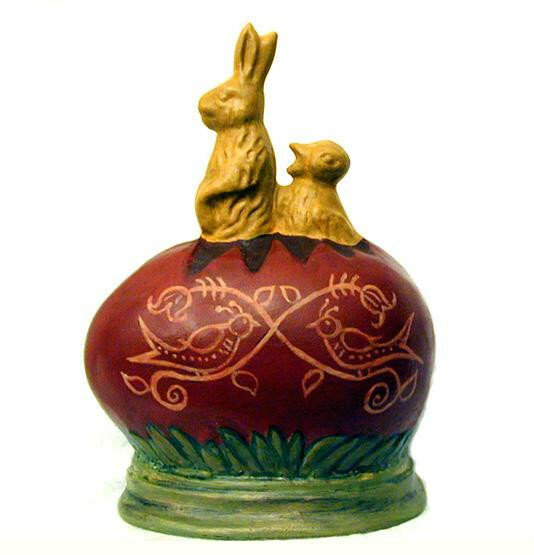 Bring a piece of New England folk art into your home for the holidays with this hand crafted Yelloware Rabbit & Chick in a Redware Egg. This wonderful piece was inspired by Early American Yelloware bowls, hand crafted using an antique chocolate mold. Bittersweet House Folk Art brings together the German tradition of folk art chalkware with the warmth and charm of antique yelloware bowls from early American colonial days and offers a unique, hand crafted treasure that will last a lifetime. Offered here is a Chalkware Yelloware Rabbit & Chick in an Onion Skin / Redware Egg. The figure was cast using a wonderful highly detailed rare antique German chocolate mold and is hand painted with my Signature Yelloware bowl and Redware finish and Sgraffito design. The piece is then glazed, antiqued and polished to give it the beautiful appearance of early Yelloware and Redware. This absolutely charming figure, measuring 5 - 1/2 x 4 - 1/4" inches, is signed "Bittersweet House Folk Art, K. Campbell".